When it comes to water proof lightweight luggage, many people have a hard time picking luggage between similar brands like Samsonite and Nautica. For instance, Samsonite’s Nobscot 5-Piece Luggage Set is very water tight and ideal for lightweight travel, however its design and style options are very limited. The Nautica set on the other hand includes multiple style options which effect every design for the better, each suitcase is constructed from lightweight materials with high-density water-resistant coating that looks great in multiple color schemes. The set comes in 4-pieces which include a full checked bag, medium or optional carry-on, and a 20-inch carry-on along with a messenger bag. At just a glance the design elements are the Nautica lifestyle standard with a dual color scheme that screams fun in the sun, it’s a distinctive look which is easy to move on spinner wheels with an ergonomic handle grip. Also, unlike most options from other brands, on of Nautica’s design goals is to make their luggage affordable for the average traveler; this set is no exceptional and very budget friendly. All suitcases in this collection feature enough storage together for a 2 to 4-week trip (depending on how you pack), each bag offers an extension zipper for up to 15% more packing space and since Nautica materials are so lightweight and stretchy, you’ll be able to fit all those extra clothes you normally couldn’t take with you. Additional storage comes from the front deep zippered pocket which is great for extra outfits, fitting travel papers, or just general extra space for organizing your stuff. On its own, the 28-inch size large suitcase offers enough space and stretch to fit up to two weeks of clothing, and similarly the medium bag and carry-on can hold quite a lot for weekenders or even week-long trips. The 21-inch carry-on is tested to meet all overhead requirements for national and international flights (so long as the packed weight is under 50 pounds) and like the other two suitcases it has a separate zippered attach-in toiletries pouch and a deep watertight zippered interior pocket. As a personal item the Boat Tote Bag can be packed quite heavily and measures 16 x 12.5 x 6.5, meaning you could easily fit snacks, electronics, and extra outfits all at one time. 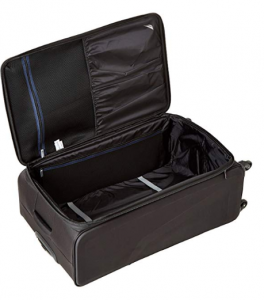 Each suitcase is extremely water tight with outer materials finished in a water wicking coating, while the inner lining is top of the line and even includes a separately lined pocket for your valuables which is zippered and quite deep. All zipper closures are extremely durable, big enough to fit a TSA lock, and designed with large pull tabs which are not going to break during your travels. The Boat Tote bag includes a deep central space and 4 pocketed sides for all your odds and ends, additionally all the suitcases have interior attach-in toiletry bags. This Nautica set design features 4 spinner wheels screwed into the body but left a little free floating, meaning they’re not the strongest wheels but still better than riveted or 8-wheel designs. Last but not least, each suitcase comes with an ergonomic aluminum telescopic handle. It is worth noting that some styles of this Nautica set, like the 4-Piece set in Red/Classic Navy don’t include the tote bag and instead come with 4 differently sized suitcases. Lightweight luggage is Nautica’s specialty, and therefore not only are the bags in this set designed from extremely flexible lightweight micro woven polyester, but all interior structuring and handles/zippers are also made from lightweight aluminum. Not only will this help you beat those pesky airline restrictions, but also the fees you encounter from going over a weight limit. Taking all these bags together you will have to check two of them, but fortunately the medium and large bags are pretty easy to keep under 50 pounds apiece. For the heaviest packing use the 28-inch suitcase which weighs in at 12 pounds unpacked, first because it easily offers the most packing space so that you don’t overweight your carry-on or medium bag, and second because its expandable zipper offers up to 2-inches of additional space all around. Unpacked the medium bag weighs 10.1 pounds, and the checked bag weighs 8, making both ideal for use as a carry-on, though you may have to check the 24-inch bag at the gate when there is limited overhead space on a plane. At only 2-pounds unpacked, the Boat Tote Bag makes for the perfect personal item. Softsided luggage generally sacrifices some durability to beat airfare costs and make lightweight travel possible, however most suitcases can stay pretty durable and light by using nylon or even cotton canvas materials. 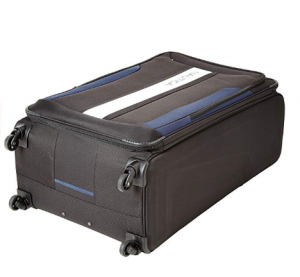 For water proofing purposes however, Nautica luggage sets typically employ 100% polyester materials with a water-wicking extra layer coating that adds somewhat more durability. Therefore, the bags in this set will be quite scratch proof and certainly very water proof, though they are quite a bit weaker than bags which use nylon, with the upside being that they’re much more affordable as a set. For instance, Travelpro’s Maxlite Collection is made from nylon with water proof coating, but not only are these bags more expensive, there are also only 3 to a set. Other Nautica suitcase durability features include extra strong and wide zipper pulls, quality polyurethane wheels, and aluminum locking trolley handles; although these handles do shake a little when extended and don’t slide in or out as smoothly as well-made telescopic pulls. Side haul handles are also integrated into every suitcase to make it easy to pull your bag from a trolley, car, overhead, or carousel. 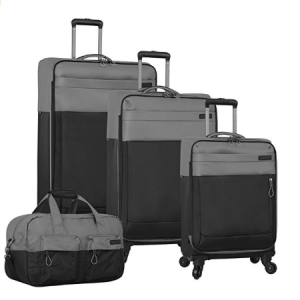 One of the customer favorites about Nautica luggage sets are their wide range of style choices. With this 4-piece Spinner set you have 8 different color choices, with our favorite being Navy Orange because it’s bold and very professional and you won’t ever overlook it on an airport carousel. One major point, however, is that some color options for the 4-piece spinner set don’t include a Boat tote as the 4th bag, instead Black/Navy and Red/Navy come with two mediums as well as the large and check-bag items. 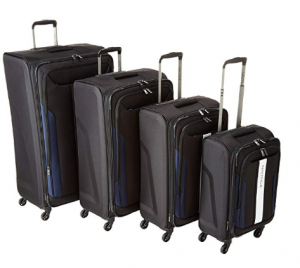 The large bags in the 4-suitcase sets also include a 32-inch large, rather than the standard 28-inch. Finally, a last unique feature is that some styles have the Nautica logo boldly printed on the front or side; not only is this stylish, but it’s a unique way to stand out in a crowd which also supports a fantastic life brand that everyone should be a part of.  In the standard set featuring 3 suitcases and a Boat Tote Bag, the traveling sizes include a carry-on with dimensions at 21x14x7 inches, medium at 24.5×16.5×8 inches, and large checked bag at 28x18x9 inches. The boat tote emptied weighs 2 pounds and measures in at 16×12.5×6.5. All together this set gives you two checked item and a carry on, but for shorter stays or even regular trips you can substitute the medium bag as your carry-on item rather than always using the smaller 21-inch. Additionally, the tote is a little too big to fit under your seat fully packed, but carried as a personal item it can fit quite a lot of extra packing and either sit at your feet or be fitted into available overhead spaces. Unfortunately, the 28-inch large bag will always need to be checked before security, so make sure you double check your bags weight if you’re not ready to pay extra handling fees for different national and international flights. 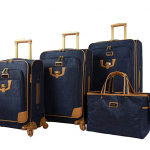 Nautica’s luggage sets include a 5-year warranty which covers any manufacturing errors and will either offer repairs or entire replacements on bags in the set or the entire set; although manufacturing errors are rare and you most likely won’t have any problems. Just in case however, its always best to be prepared and so make sure you contact the distributer and opt in for the warranty. Personal damage from misuse, dropping, or otherwise neglecting your suitcase will not be covered by the warranty. Nautica luggage isn’t one of the only lightweight luggage brands on the market, but it is one of the best brands for light luggage that’s also highly water proof and very budget friendly. 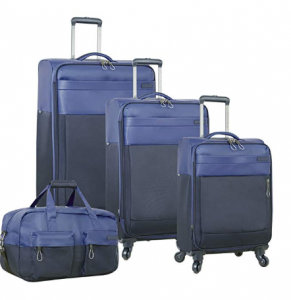 Nautica’s 4-Piece Spinner Luggage Set is no exception and offers the best polyester woven materials for fairly durable lightweight options that aren’t as expensive as cotton canvas and nylon. Additionally, this collection has one of the finest range of styles that allows you to choose between 4-suitcases or 3-suticases and a Boat Tote bag, depending on the packing space and number of carry-on items that you need for your travels. 100% lightweight Polyester materials with a durable micro-woven design. All materials are treated with a water-wicking coating. More affordable than most 4-piece nylon and cotton canvas sets, and even some 3-piece sets. Telescopic handle is poorly designed on some suitcases. Some style options don’t come with a Boat Tote personal item.